There are a lot of books out there and all of these books have titles. 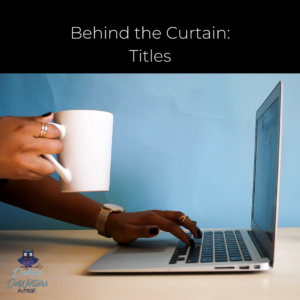 Although I’ve been writing professionally since 2011, the most difficult part of writing is —besides choosing the name for your character—is picking a title for your story. The title has to serve so many functions: it has to draw the reader in, it has to be (usually) short enough to fit on the book cover and still be readable, and it has to give some sort of idea about the story. Unless I get hit by a bolt out of the blue, it’s a struggle for me to get a title for a story. Usually, I harass my writer friends (whom I’ve also harassed to read the book in the first place) to give me a title. Did I say harass? I meant ‘beg and plead’. I can write a passable blurb. I’m even getting the knack of taglines. But my titles? Not so fast there! My first professionally published book was titled “Kitty Wishes” about a shapeshifting cat. Boy, did I dodge the bullet on that one, because the title hit me right before the story did. Little did I know, the title road ahead would be difficult. However, despite my hemming and hawing, I was able to do a few good titles, but I got stumped once. It was a zombie short story and no matter how I searched and thought and searched again, I couldn’t come up with something catchy. A friend of mine offered “Duty to the Dead” which was wonderful because it gives the zombie vibe, as well as a tiny clue as to what the story is about. I got smart after that. Because I’m a lover of music, especially 80s, I found a treasure trove of titles for my (sort of) new music series. Not only are the titles usually short, but they give an immediate sense of what the story is about. Saved! Melodies of Love is my newest series that will be coming your way in September. The titles are: True Blue, Never Walk Away, and Unbreak my Heart. Now, La Belle Bete is also part of the series, but alas, the title came before the concept. I thought about renaming it to The Tender Trap, but hey, you can’t have it all. So, now I turn to you: As readers, what title attracts you to a book? Writers, how do you come up with your titles? Do they hit you out of the blue, or do you have to work at them like I do? Leave your thoughts in the comments.